You have just been caught for fraud from selling your previous company's aircraft worth $200,000,000. The authorities have revoked your license and you have been fired. You are left with $1,500,000 after bribing the authorities to give back your license for $1,000,000. You have chosen to start a new airline with a goal to run the company you used to work for into ruins. To do this you have made a list of requirements to be met. Due to your bad behaviour, your airline has started with 20% reputation which can not go bellow 15% otherwise the authorities will search for and arrest you. This is the payload model for PMDG 737-800NG Delta Airlines. Happy flying. This is the payload model for PMDG 777-200LR Singapore Airlines. Happy flying. This is the payload model for PMDG 777-200LR Emirates. Happy flying. This is the payload model for PMDG 777-200LR Delta Airlines. Happy flying. This is the payload model for PMDG 777-200LR Lufthansa. Happy flying. New Carenado Hawker 850xp To Fsx and p3d! 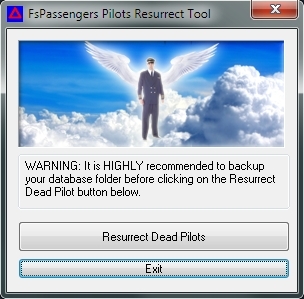 This tool can resurrect your dead pilots.